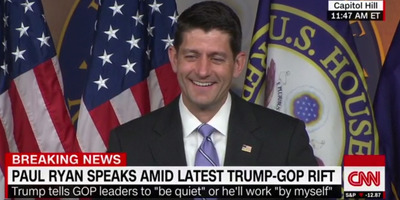 In his initial endorsement of Trump earlier this month, Ryan said Trump made it clear to him he respected the separation of powers between the three branches of the federal government and backed policy supported by Ryan that would make those separations more clear. But that was not the tone Trump struck Wednesday when he hinted at an Atlanta rally that he may take unilateral action if GOP leaders refuse to “get tougher” and stop criticising him. Ryan said Thursday he intended to “defend the separation of powers,” arguing that US citizens will “lose our freedoms” if one branch infringed on another branch’s powers.